2017 is almost over, so it’s time for our third annual GOLDEN STANDEES! The award show where we give out very niche awards to things we enjoyed this year. If you curious about the previous winners take a look the 2015 and 2016 editions. the People’s choice golden standees! 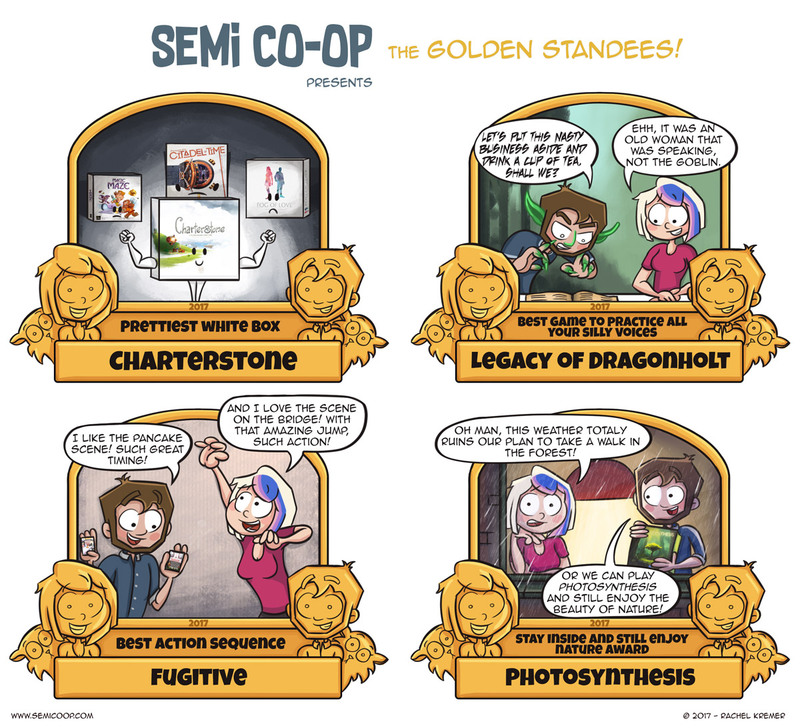 We would love to see what games or which content creator you think should be given a golden standee! On Twitter, we’ve had some fun discussions about awards, but it isn’t real until you’ve submitted it! We will share all awards on our social media accounts and make a selection to be published on the website. Don’t be afraid if you feel like you are not “creative” or don’t have art skills! We’re looking to have fun and we all know that a simple stick figure drawings can be just as funny as a great cartoon. You can also take a cool picture, everything is welcome. Remember that we are looking for ‘funny’ awards, not the award for “Board Game of the Year”, etc. The final deadline for contributing your own award is December 29th 2017 and you can send it to goldenstandees@semicoop.com. If you have any questions, don’t hesitate to drop us a message. If you don’t have any experience with graphics software, but you do have an amazing idea for an award and want to draw it on paper – that’s fine too! You can just scan your drawing and mention your award name and the winner and we’ll make a fancy Golden Standee for you. If you want to do this, I do advise you to download and print an image of the Golden Standee from the URL above to make sure you are using the right dimensions. We can’t wait to see what creative ideas you come up with! We have some free time the coming weeks so we’ll be playing more Legacy of Dragonholt together, which just decided to crank up the intensity and slap us in the face about a wrong decision. We will also have some gaming sessions with friends playing Eldritch Horror (does that game ever get old?) and Pandemic Legacy Season 2. Behind the scenes we’re also planning for 2018 which will have a ton of great Semi Co-op things for you to enjoy! Do you have great gaming related plans for 2018?